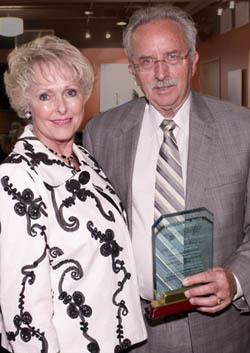 Eugene Becker, CEO of Global Sulfur Systems, Inc., received the Gene and Linda Voiland School of Chemical Engineering and Bioengineering alumni award at Washington State University on April 22 in recognition of his service to the industry and the school. Becker graduated from Washington State University with a BS in chemical engineering in February of 1956 and immediately went to work for Bechtel, Corp. in San Francisco as a process design engineer. Over the course of the next 33 years, Becker held numerous positions in the petroleum design and environment industries. In 1989, he and five fellow investors formed what is now Global Sulfur Systems in Pasadena, Calif. with the primary goal to commercialize the British Gas, plc Stretford Desalting Process to address some of the environmental impacts associated with oil refining. Over the past 20 years, the company has treated almost 28 million gallons with the Desalting Process. Treatment can be performed as a once through treatment, typically during a plant shutdown, or on a slipstream during plant operation. Slipstream processing eliminates the need to shutdown and empty an operating plant. Global Sulfur Systems has also developed a system for the filtration of sulfur sludge generated in the Stretford process, which eliminates the need for melting the sulfur sludge which can cause other operating and environmental problems. One of Becker’s crowning achievements has been his work as the lead process design engineer in developing the Beavon Process, the first sulfur recovery process for treating tail gas. The process was developed jointly by Parsons and Unocal in 1971 in response to Rule 66, passed in 1966 by the South Coast Air Quality Management District (SCAQMD), then known as Los Angeles Air Pollution Control District (LAAPCD), which limited sulfur emissions to a maximum of 500 ppmv. The rule and the implementation of controls for sulfur emissions were critical, especially to residents in the LA basin who suffered stinging eyes and throats due to the high sulfur levels in the area. The adoption of the rule and subsequent implementation of the Beavon Process ultimately eliminated over 100 tons per day of sulfur going into the atmosphere. The Beavon Process consisted of hydro treating the Sulfur Recovery Unit (SRU) tail gas to convert all of the sulfur species back to hydrogen sulfide, followed by recovery of the Hydrogen sulfide (H2S), either as a solid sulfur as in the Stretford process or an amine system and recycle H2S to the front of the SRU. When the plant started up in August, 1973, it was extremely successful; emissions were consistently less than 50 ppm and the plant received world wide interest with many engineers visiting to see it in operation. Recipients of the Voiland School alumni award are selected by the school advisory board in tandem with the director and faculty. The award is based on accomplishments that illustrate the impact of the education received at WSU in either Chemical Engineering or Bioengineering. To date, only eight other individuals have received this award. Mr. Becker will join the ranks of alumni like O.H Reaugh (‘33), Gene Voiland (‘69), Tim Clossey (‘80), Tom Gradel (‘60), Paul Hohenschuh (BS ‘64, MS ‘70), Jim Lafferty (‘44), Brion Wise (‘68) and Yong Wang (PhD ‘93).